Whether you’re a guest or the bride, it’s an undeniable fact that looking good is a must at any wedding and the same standard applies to your hair. For a style that will be etched in the memories of those around you, check out these lovely black wedding hairstyles! A beautiful side bun can enhance any formal outfit. 2. Section out a triangle for side bangs. 3. Smooth hair to preferred side. 4. Use a finishing spray for firm hold. Use the Olive Oil line’s light sheen to enhance the shine of the hair. This style suits all face shapes and long, straightened hair. For a fuller bun, add straight extensions into the braid. Use long, sturdy pins to keep the bun in place. This style features pinned up curls for a classy do. 1. Part hair on desired side and smooth. 2. Curl the rest of the hair using a 1 inch curling iron. 3. Pin up curls as desired. 4. Use serum to add shine for the finishing touches. Matrix Essentials sealing serum works well for this style. All face shapes can rock this do! This styles is best suited for straightened medium to long hair. When using the Matrix Essentials sealing serum, rub a small amount in the palm of your hands and work your way towards the scalp. High side buns with sweeping bangs will keep all eyes glued on you. 1. Section rectangle shape at the interior of head. 2. Style bangs as desired using a 1 ½-inch gold barrel iron. 3. Smooth the rest of hair to preferred side. 4. Braid ponytail and twist hair into a bun. 5. Use hairspray for light hold. Eco-Styler gel works well to make this style sleek. Oval face shapes best suit this style along with straight medium to long hair. Since gel tends to dry out hair, try using Pure African Shea Cream leave in conditioner to lock in moisture before applying gel. 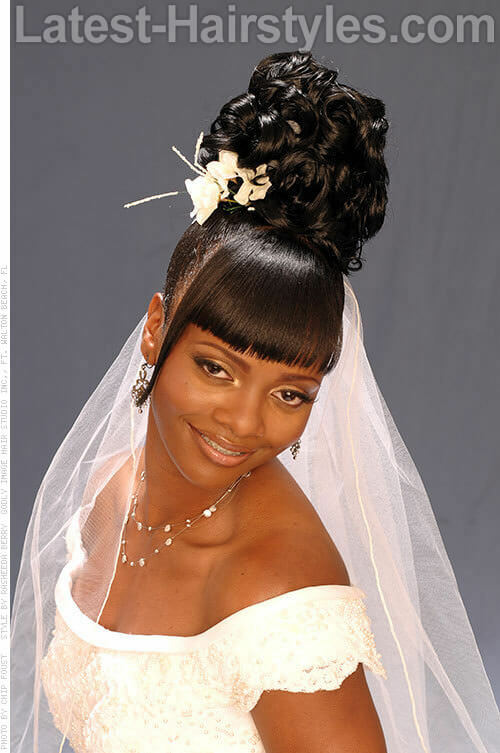 This style features the timeless bridal style of a curled bun. 1. Section out triangle bangs. 2. Pull one piece of hair on each side of the bang. 3. Smooth the rest of hair into ponytail. 4. Curl the ponytail using a 1-inch curling iron. Pin curls as desired. 5. Use firm holding spray. Sebastian Fierce Shaper will keep your wedding hair intact all day! I recommend this style for smooth hair and all face shapes. If you want a fuller bun add a curly extension around the ponytail and use bobby pins to hold. Loose ringlets are so pretty and versatile! Check out this bridesmaid-perfect do. 1. Section out bangs. Use a 1-inch curling iron. 2. Use a 1-inch gold barrel curling iron to curl entire head. 3. Use serum to smooth hair to the side. Pin curls to keep hair in place. 4. Use light spray to seal the look. Cynos oil treatment will replace the moisture taken out by the hairspray. Suits all types of faces. This style works best on medium length hair. For added style, use a fascinator of headband as an accessory. Naturally curly hair can be formal too! Side flat twists and well formed curls are perfect for a wedding. 1. Section hair in 2 halves. 2. First half, part and flat twist hair into a ponytail. 3. Second half leave curly. 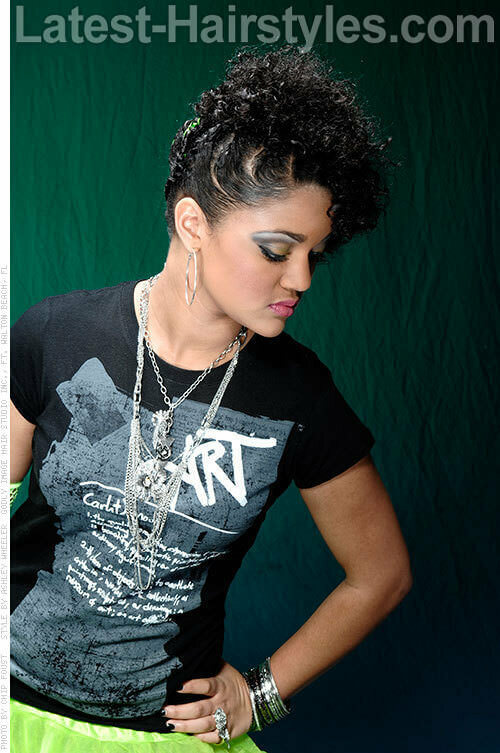 Use Techni Art from Glam wave to keep natural curls defined. Oval face shapes and natural curls are best for this style. 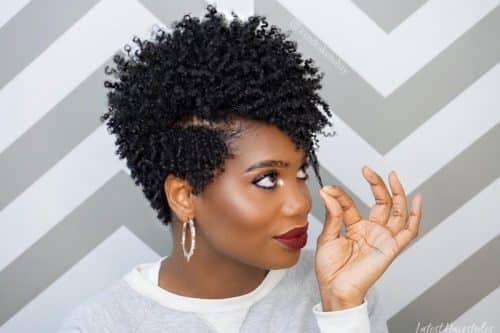 If you don’t have naturally curly hair, use curl formers, perm rods, or bantu knots to get your desired curl pattern. A loc’d updo says “look at me!” in any crowd. 1. Flat twist dreads into side pony tail. 2. Take the left over hair and wrap 5-6 dreads. 3. Either pin the ends of the locks or tie them into style. 4. Use hair spray for light hold. My Gel from Joie Naturals will have your locks looking luscious. This style suits any shape. If your face is rounder it will give a slender look. 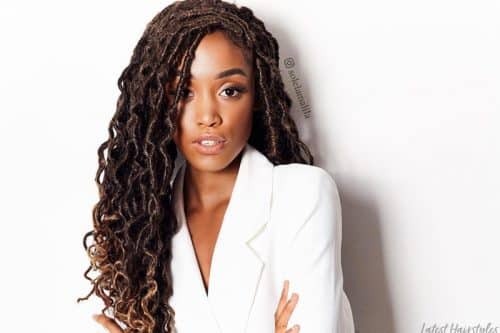 Locs, braided or twisted extensions work best for this style. My Gel conditions, thickens and nourishes hair so you don’t have to worry about the drying effects of the hair spray you use. This style features a beautiful, intricate twist pattern on the back of the head for a unique statement. 1. Section hair in 2 from ear to ear. 2. Part and flat twist bottom half into bun. 4. Create rolls with top portion of ponytail. Use Keratease cleansing oil shampoo to keep your hair healthy. This style best fits round face shapes. Smooth long hair is recommended for the best results. Use Keratease shampoo after wearing this style to keep your hair in great shape. The shampoo can be paired with the matching conditioner to replace the missing moisture. 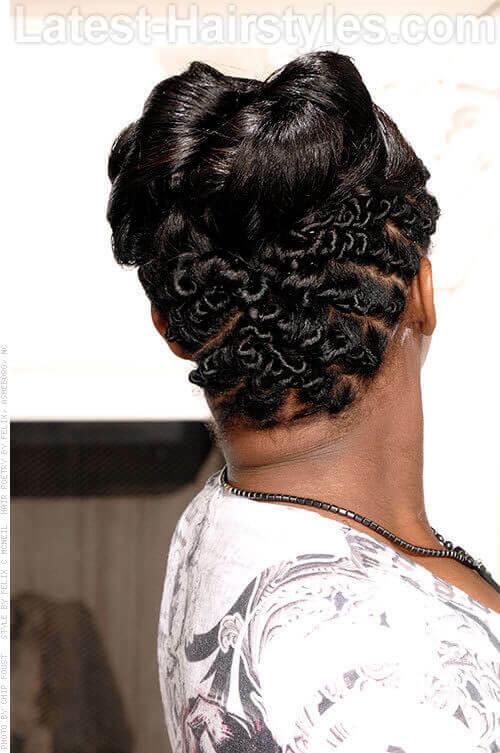 This style features free style flat twists worn to the side. 1. Section out rectangle portion of hair. Curl hair using small curling iron. 2. 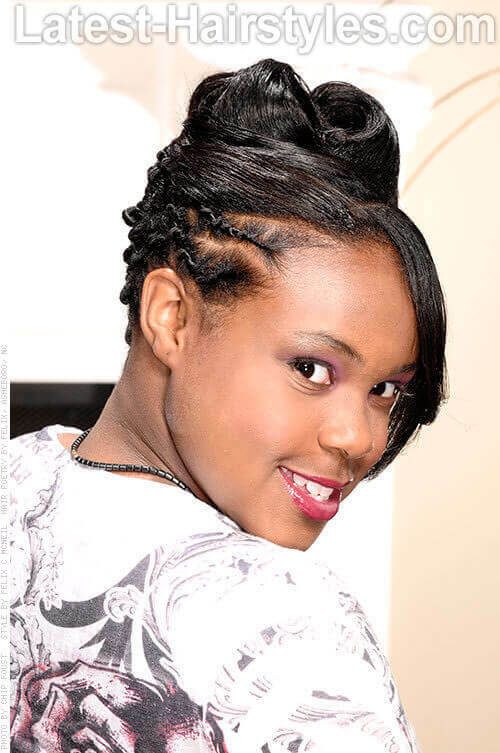 Part and flat twist hair into desired style. 3. Use light sheen for finishing touches. Professional Sebastian Molding Mud will help hold the flat twists in place. Any face shape suits this style. Straightened hair is recommended for this hairdo. If the Molding Mud isn’t strong enough, use Professional Sebastian Gel Forte for a stronger hold. Gels could dry out the hair so remember to put your oils like coconut or argon in the hair before styling. 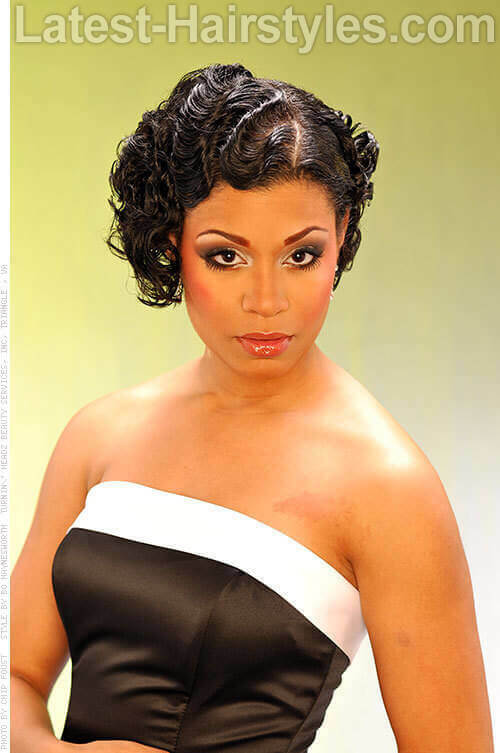 Finger waves are making their way back into style, especially for special occassions. Stay on trend with this look! 1. Section and mold hair into style similar to photo. 2. Create waves using fingers to front side portion. 3. Create curls to the rest of the hair using natural curl or 1-Inch gold barrel curling iron. Eco-Styler Black gel is the perfect product for clean waves. Any face shape will suit this style. Medium to short hair length and wavy to smooth hair best suits this style. If the gel alone makes the hair too hard to mold, add in a little bit of diluted Lotta Body to soften. 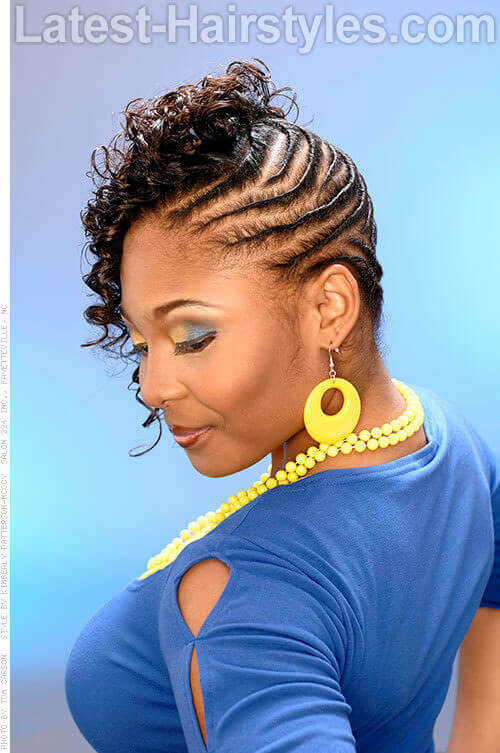 This style features micro braids in three twists for a queen like crown. 1. Section braids from ear to ear. 2. Part front section into 3 sections. Twist all sections into bun. 3. Leave braids in the back out for half up do. 4. If possible, curl the ends of braided hair. 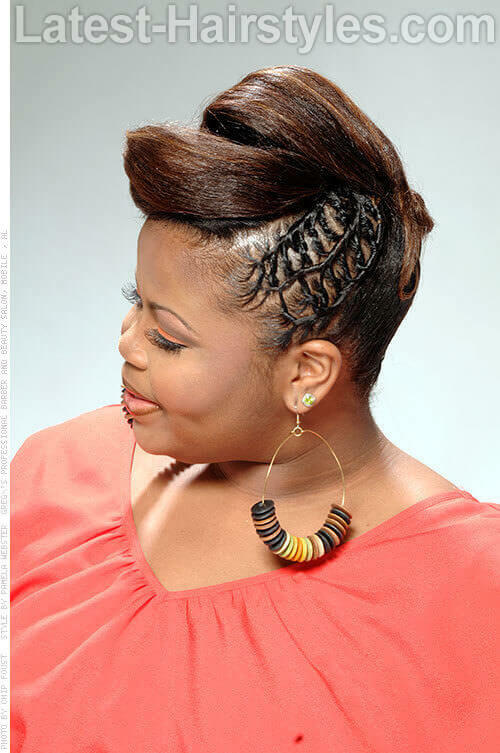 Use silky extension hair for this type of micro braid. Any face shape suits this style. 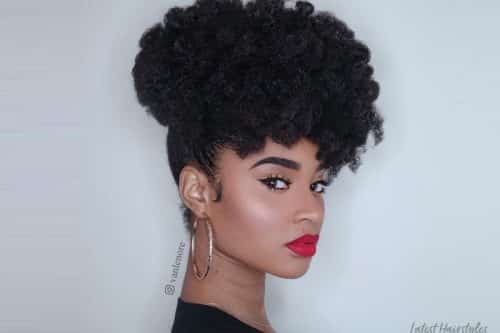 Any length and type of hair suits this style. 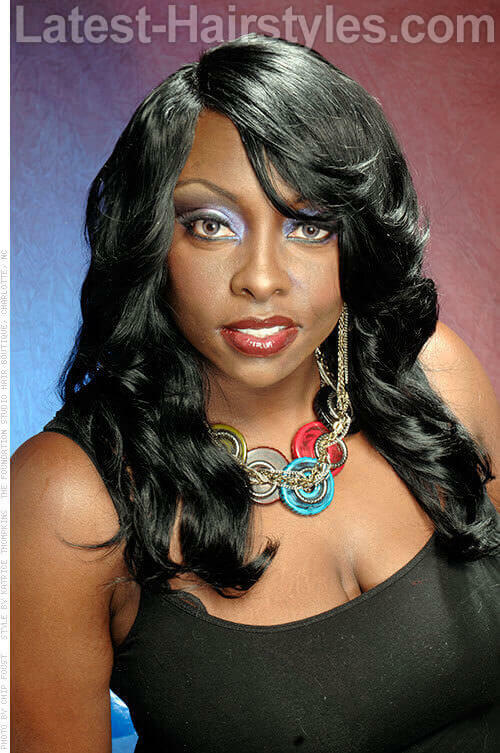 There are pre-curled extensions that don’t require extra curling after installation. Find the hair that best suits your style. 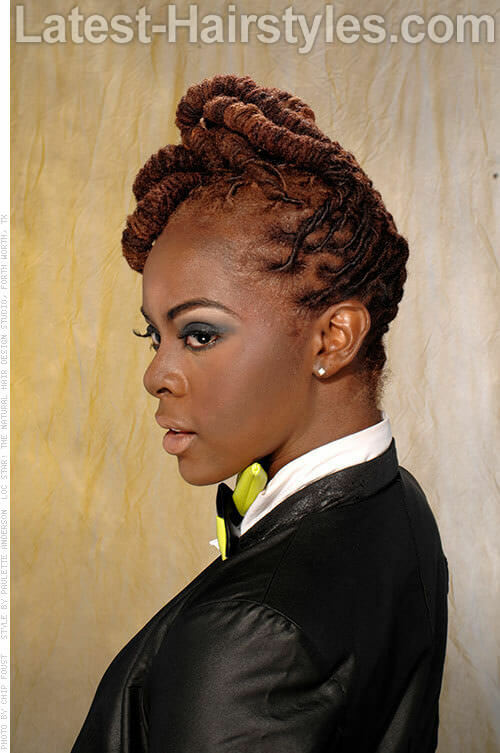 This style features another variation of flat twists and curls for a polished look. 1. Section out circle in interior part of head. Flat twist into desired style. 2. Smooth back the hair in the front by the ears. 3. Curl the back of the hair using 1-inch curling iron or rollers of your choice. Gel can easily dry out your hair so use African Pure Shea Butter treatment to restore the natural oils and damage to hair. Any face shape suits this style. Long smooth hair is recommended for the best result. 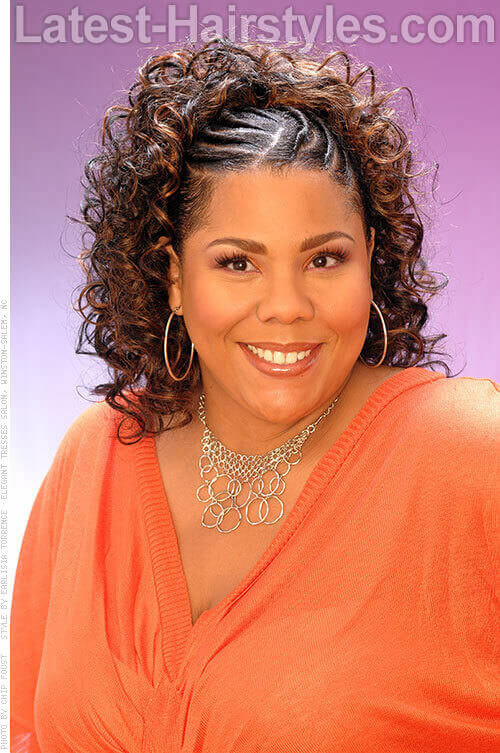 If you would like a more protective style, braid the back of the hair and sew in a curly weave. This classic style makes a perfect formal hairstyle that can be done in a matter of seconds. 1. Part hair where desired. 2. If you have bangs, curl them using a 2-inch gold barrel curling iron. 3. Use the same curling iron to create large ringlets throughout hair. 4. Use hairspray for firm hold. Professional Sebastian hair spray will give the perfect long lasting hold. Any face shape suits this style. Long straightened hair best suits this style. Add hair sparkles before applying the hair spray for an enhanced look. 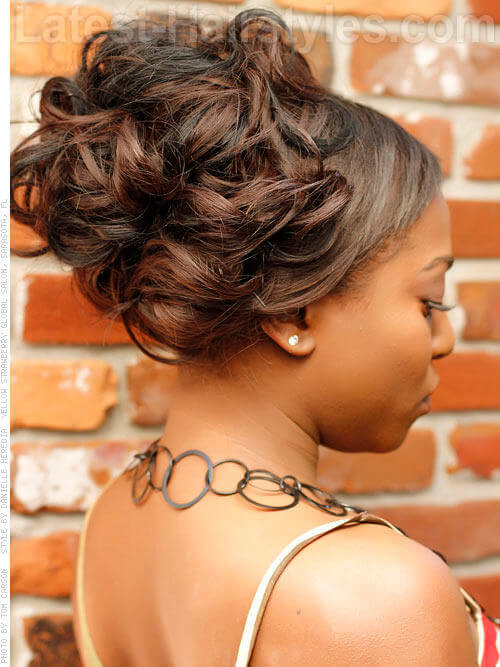 Intricate twists are used to accent this simple up do. 1. Section out a side portion in front of head. 2. Twist hair as desired. 3. Smooth the back of the hair up into high roll. 4. Take the rest of the hair in front and wrap around like crown. Pin hair into place. Marrakish Oil from the Love line will help keep your hair healthy. Round face shapes will appear more slender with this style. Smooth, medium length hair best suits this style. Try using Marrakish Oil daily treatment for damaged hair. These sweet curls add a fresh and youthful appearance to any woman. 1. Part hair 2 inches away from either ear. Curl hair using curlers or a ½ inch gold barrel curling iron. 2. Use hair sheen for shiny finishing. Use Paul Mitchell’s green line serum for a sleek finish. This style suits any face shape and long hair. Tease curls for messier and thicker results. 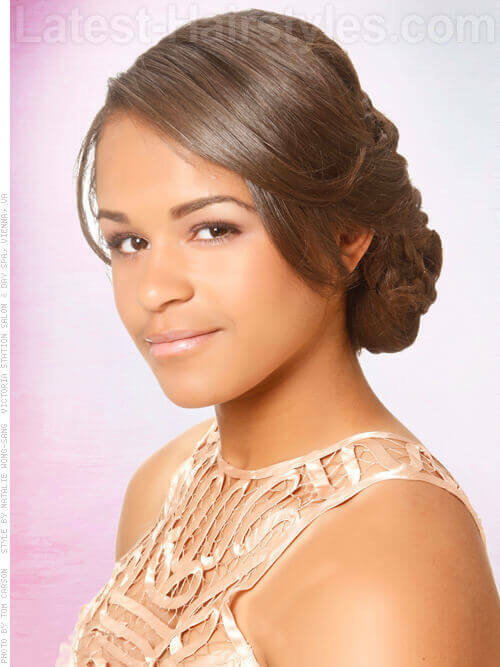 This do features a center french braid for a unique look that naturally elongates the face. 1. Section hair from ear to ear. Part 3 sections in front portion. 2. 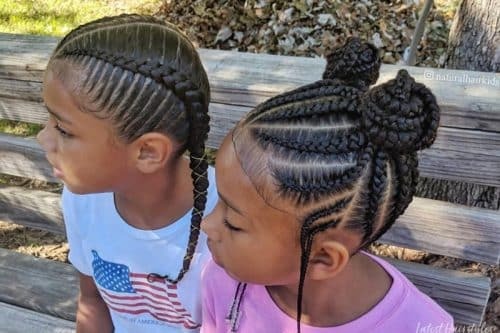 Twist or braid one side of head. 3. Holding the hair loosely, make an overlap braid in the middle. 4. 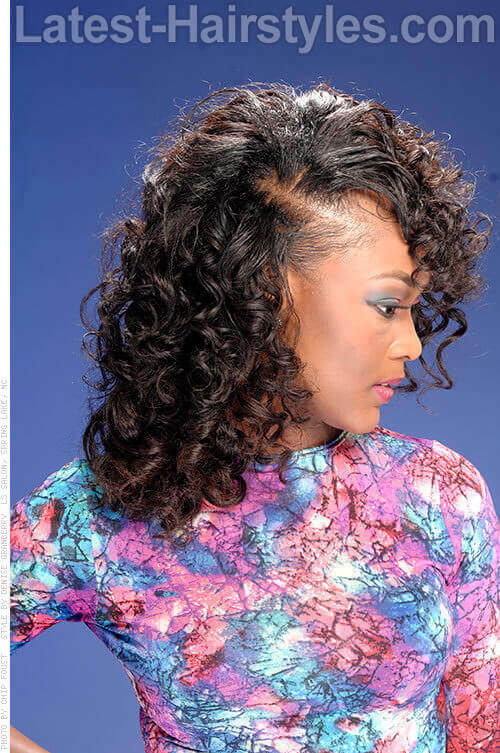 Curl the rest of the head using a 1-inch curling iron. Smooth to one side. 5. Smooth the last section of hair back into curls. Pin in place. 6. Use sheen for finishing spray. This style suits all face shapes and straightened hair. 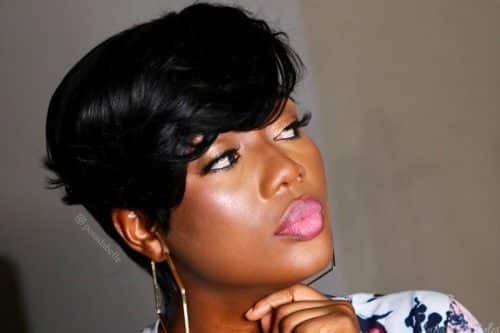 You now have the how to’s for 17 amazing black wedding hairstyles so don’t waste another moment looking for the perfect style. 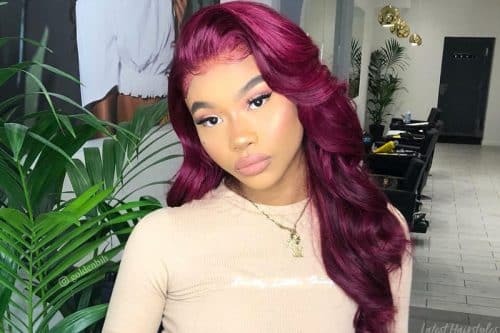 Try one of these styles at home yourself, or set up an appointment with your favorite stylist then see how you dazzle the crowd!